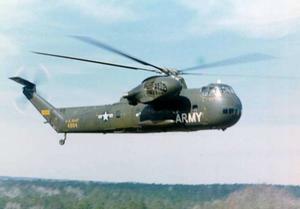 The S-56, at the time of its introduction, was the largest and fastest helicopter in the western world. It was also Sikorsky’s first multi-engine, retractable main landing gear helicopter and remains the largest piston-engined helicopter ever built. 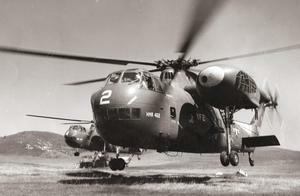 Designated H-37 Mojave by the US military, three primary models (A, B and C) were developed. Key differences included a hydraulically folded tail rotor pylon on the H-37A and an automatically folding main rotor for the H-37C. The H-37B added automatic stabilzation equipment which allowed for hands-off and instrument-only flight, as well as moving the stabilizer from both sides of the rear fuselage to the top right side of the tail rotor pylon. In 1956 a USMC HR2S-1 helicopter set three records: a speed record without payload of 162.7 mph (141.4 kts); an altitude record of 12,100 ft (3688.1 meters) with a 11,023 lbs (5000 kg) load; and a load carrying record of 13,227 lbs (6000 kg) to 6,561 feet (2000 meters). Follow this link for the first flight of the type.